Recently, I wrote about the dangers of prescribed fire, in what turned out to be kind of a downer of a post. Sorry about that. My main point, really, was that burning without clear objectives is just taking a risk for no good reason. I also think it’s important for all of us to be reminded of just how dangerous fire can be. As a kind of counterbalance to that post, however, I present the following photo from one of our fires this spring. To me, the photo elicits a wide range of emotions. It illustrates both the beauty and dangerous power of fire, all wrapped up in one frozen (so to speak) moment in time. 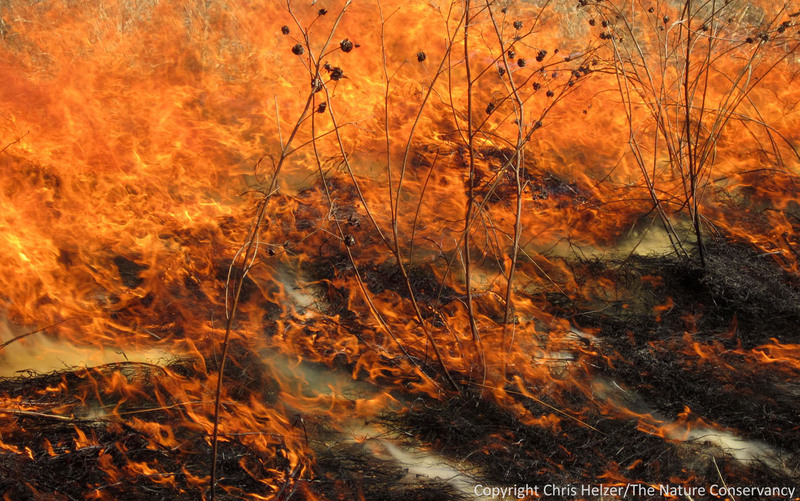 A 2012 prescribed fire in The Nature Conservancy's Platte River Prairies. While prescribed fires are stressful for me, I can still find time to appreciate – and sometimes even photograph – the beauty of fire as well. …and later, after the fire is safely out, I can appreciate the photos even more! This entry was posted in General, Prairie Management, Prairie Photography and tagged beauty, danger, photography, prescribed fire by Chris Helzer. Bookmark the permalink. Chris, I think everyone understands what you have been trying to say. The fact is, prescribed fire is so necessary for the health of midwestern ecosystems that those responsible for land management do not want anyone to ‘ruin it for everybody.’ What happened in New Mexico years ago is a prime example. This shutdown prescribe fire on federal lands for years. The massive accident and death toll in Florida from smoke blinding drivers on a major highway is another example. Currently, a prescribed burn turned wild fire in Coloado is still occurring. We feel for the people impacted first. However, we also feel a loss when the tools needed to preserves lands we have spent our lifetimes managing are taken away. I myself recently saw what I considered a near miss. A prescribed burn was being conducted by contractors on local village property. A much larger break should have been cut into a marsh before burning. There were homes off the flank of this marsh. I felt it necessary to inform a burn boss who works for the county about my observation regarding this burn. These contractors could have burned someones house down and stopped burning in the entire region. Being a burn boss is a stressful job. If you do a good job, people rarely thank you. However, if you make a mistake long time friends act like they have never known you. We all need to consider this next time we complain our site has not gotten burned enough. And, when it does get burned we need to thank the guy who takes the heat (both literally and figuratively). Drove by your burned area this past week chasing cranes and was impressed how deeply the fire burned, indicative of a slow, controlled fire. I imagine in a few weeks that will be lush green pasture. I’m sure the word is spreading just as fast through the cow herd about future grazing. We need to realize fire has been on the prairie much longer than we have and if we want prairie then fire is just one more aspect we have to deal with. If people are afraid of their house burning down they shouldn’t build one next to an active prairie. Unfortunately houses continue to be built in flood plains so I don’t know as a race whether we’re learning anything about our place in the ecology. Thanks for the offer. Annual pilgrimage to the cranes for me so I’ll get in touch with you by next spring at the least. Other business takes me your way occasionally so I’ll give you a shout if that happens. Would love to see the place and get a better sense of what you’re doing. Wow – look at that color and movement!